On Monday, October 29th, CCE, First-In-Family Programs, the Academic Success Program, and FLIP co-sponsored an event called Telling Your Story as a First Generation or Low-Income Student – Alumni Panel and Networking. It was an opportunity to hear from alumni about the ways in which their identity played a role in successfully navigating Columbia and the job search and how experiences inside and outside the classroom gave them skills that employers seek. Students also had the chance to network with alumni and peers in an intimate small group setting. Panelists were asked what tips and advice they had for other first-generation college students in crafting their own story for employers. “Give your truth context” is how one panelist described his approach to developing and sharing his story. The advice was to take your life experience and make it meaningful by reflecting and drawing out what makes it relevant to each employer. You’ll have different versions of your story depending on your audience and what you are applying to. Reflect back on what you’ve done to get to Columbia. Panelists shared that while their first-generation or low-income status did not always come up explicitly in interviews, it often came up as they got to know colleagues in the workplace. The skills they developed through their experiences, which were shaped by their identities and backgrounds, were of interest to employers. Learning how to articulate those strengths became important. Panelists emphasized the importance of reflection to figure out what you’ve learned and developed while at Columbia. When reflecting on skills they gained on campus, panelists said that Columbia gave them the opportunity to communicate and develop relationships with people with different backgrounds and interests. Building that capacity along the way served them well in the workplace. Panelists all encouraged students to connect proactively with their Columbia peers as a resource for information on navigating the campus and a job search. They shared stories about people they met in their residential halls, in classes, in student clubs and activities, who became and remain close friends. They also encouraged students to reach out to faculty and advisors during office hours as these staff want to help and support you. Panelists shared that it is not always easy knowing what questions to ask and encouraged students to actively observe and listen to other’s questions. Also, when you feel stuck, don’t run away. Sit with your feelings and see what comes up for you — trust yourselves to figure this out. Jot down questions you hear and use them. Watch at career fairs, watch videos. There are lots of ways to learn. One panelist spoke of how he consistently considered how to help. Having an attitude of seeking to support has allowed him to both build a strong network of meaningful connections and also had provided opportunities that he didn’t expect to receive. Another panelist spoke about keeping networking organic and sincere by reflecting on what you would like to learn from others and offering to help them in any way you can. They also advised students to follow up – the sooner the better when you make a connection. Another panelist spoke about learning to be flexible to take advantage of unexpected situations to learn more and make new connections. She happened upon a career fair in a hotel in midtown, chatted with some employers because she was there, and ended up with an internship. Alumni and students also spoke about how to stay in touch and navigate family relationships while being here on campus and beyond, especially when life on campus seemed like a million miles away. Alumni spoke about managing their time. Work-life balance is a constant struggle so carving out time to stay in contact became more and more important of alumni. Keep in touch also when stressed out to let them know what’s going on with you. Make the effort to explain what you are doing at school or work if it is new to them. Enjoyed hearing from alumni? 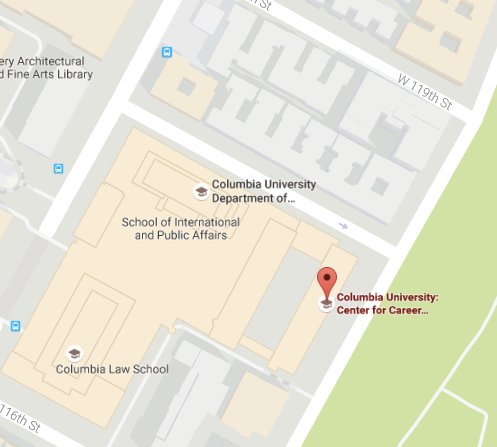 Stop by CCE for a 30-minute appointment to chat further about how to engage with Columbia’s vast alumni network!